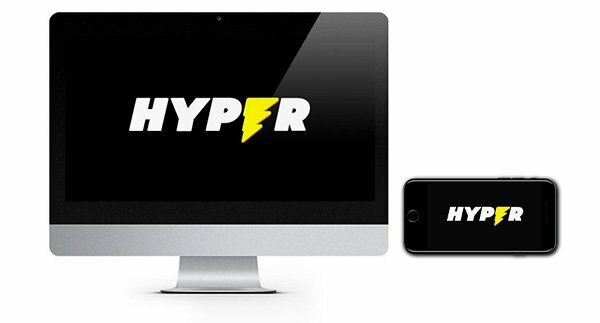 Hyper Casino is a new casino for 2019, and they look the part with their lightning bolt logo and impactful casino design. The energy and excitement seem to ooze from the pores of this casino and players will thoroughly enjoy the games here which include titles from NetEnt, Microgaming, NextGen and many more. As the style of this casino would indicate, there’s no hanging around here. It’s all about fast and fun gaming whether you are playing at home or on the go. 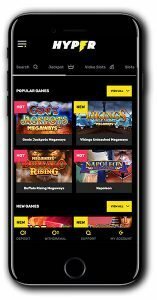 The casino has been developed to perform on all devices, and in fact, the black and yellow colour scheme works well even on a smaller screen size. 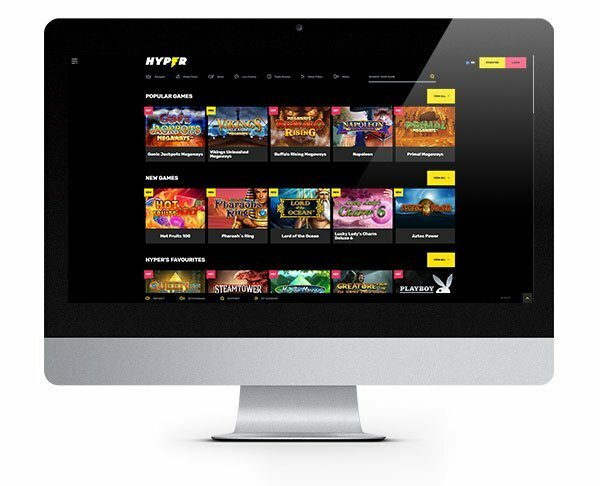 Hyper Casino has a fun vibe, and it’s easy to get swept along in the fast-paced nature of the site, but should you hit a stumbling block you will find plenty of helpful advice in their FAQ section. It covers technical queries, bonus and account queries and more. There is also an online contact form and live chat facility for registered players should you need additional help. Deposits and Withdrawals will be handled via the same method. If you make a withdrawal request before 6 am, they will process it the same day (Monday to Friday). Accepted payment methods include Visa, MasterCard, Zimpler, Neteller, Skrill, Paysafe Card, Trustly, EcoPayz, InstaDebit, Sofort and Klarna. The casino is licensed by the UK Gambling Commission and the Malta Gaming Authority, and in line with regulations, your funds will be held separately from casino accounts. The casino lobby presents a colourful array of games. You can quickly zip through what’s available by using the tabs which can take you to the Video Slots, Slots, Live Casino, Table Games, Video Poker and more. With games from Microgaming, NetEnt, Novomatic, Scientific Games, Big Time Gaming, NYX and many other developers, there is a good mix of styles of games. 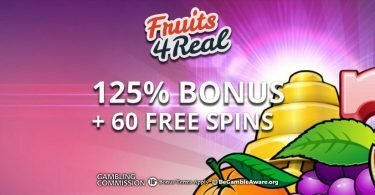 With plentiful bonuses and free spins opportunities if you know where to look! Amonsgt the popular games category at Hyper Casino we discovered Book of Ra, Starburst, Book of Gods and a heap of our favourite Big Time Gaming slots including new titles Primal Megaways and Buffalo Rising! It’s a big old collection of games that’s for sure, but not to feel left out there is a very decent line up of table games too! 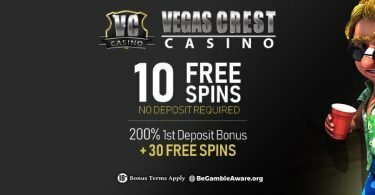 Blackjack, Double Exposure Blackjack, Baccarat, Punto Banco, Red Dog, Pontoon, Casino Hold’em, Caribbean Stud Poker and many more are waiting for casino fans to try their luck! The live casino which is powered by Evolution Gaming boasts nearly seventy table games with varying limits and styles, so there is something to fit the bill for every player preference and budget. Available to new customers only. Maximum bonus amount capped at $300 over first two deposits. Minimum deposit $10 required. Wagering requirements 45x. Maximum bet size capped at $5. IMPORTANT NOTICE – Make sure you are aware of gambling regulations in your country of residence before you register at Hyper Casino. Hyper Casino fully living up to its name with an action-packed line up of the latest and greatest slots from massive software developers!